You can watch a a video of some of SARID's building projects, by clicking below. SARID's Lesotho project, write-up below, is a Finalist, and is the winner of Judges' Special Commendation for Impact, and Novelty in the 2016 MIT Climate CoLab's "Buildings" contest. You can watch a a three minute video of some of SARID's building projects, by clicking below. or to read our winning proposal, one of three finalists out of thrity nine proposals (a worldwide open competition), and also see a three minute video at the MIT Climate CoLab website, please Click below. See "Evaluation Results" tab for international judge's commendation and comments. The proposal recieved the highest score for every judging criteria, and the highest cumulative score. 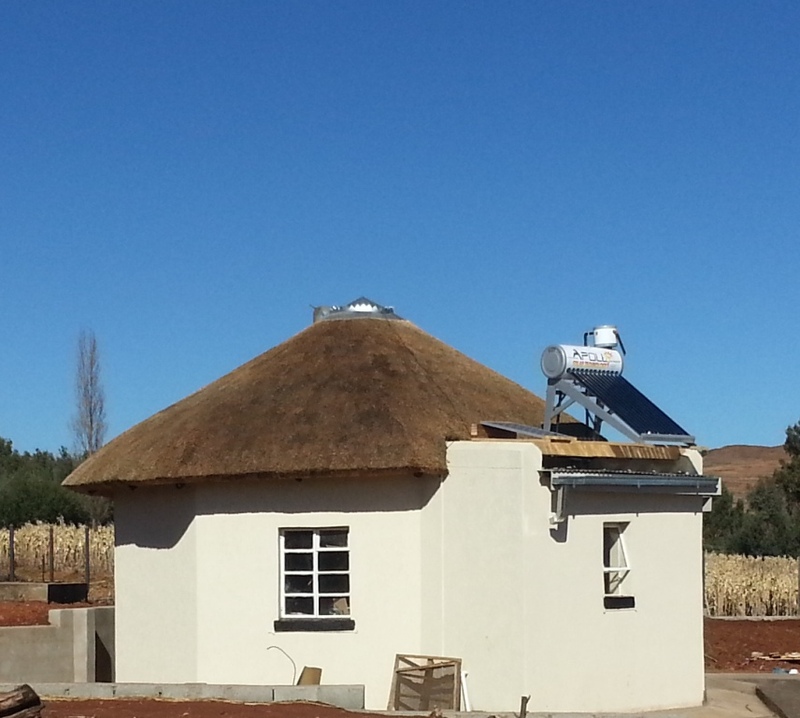 SARID has introduced a construction method/ process in Lesotho that provides for energy efficient homes, and utilizes renewable energy sources for heating and cooling. Most of Lesotho experiences freezing temperatures during winter and hot weather in summer. Most people live in unheated homes. It was built for elderly residents of a catholic charity. It is a zero-energy home, except for occasional cloudy days in winter (for about 10% of the year). Both electricty and heating is through solar photo voltaic (pv) and solar hot water heaters. Construction of the above structure was started in January of 2015 and completed in July 2015. It offers a low tech affordable solution for poorer countries that experience extremes of temperature. Lesotho: This project serves as a proof of concept, and offers one strategy, for heating all kinds of small and large buildings with renewable energy sources. We were able to build this low carbon footprint home while keeping the first (construction) and life cycle cost (30 years) well below the cost associated with current building types in Lesotho. We have selectively used a concept called elastic skin, first developed for seismic structures by Javed Sultan (JS), to increase the resistance of buildings to seismic forces and internal stresses, and to reduce the use of cement and reinforcement - whereby you essentially bag the walls in a skin to mechanically (as opposed to using cementitious binders) hold the wall together. Initial results are very compelling with buildings showing no structural distress even after Richter 5.5+ earthquake. Our walls are hybrid structures - with multiple functions and capabilities. We intend to use this technique to resist large external forces such as flood waters, or earthquake, as well as to reduce the use of cement and steel reinforcement in non-seismic design. We believe we can duplicate these results in many regions of the world. All our structures have been designed in collaboration with US and foreign structural enginners. The home is "Green", has a low carbon footprint, employs sustainable building practices, and uses less cement than comparable masonry structures. Home is made of non-combustible material, excepting for the roof. It is well insulated - utilizing waste (recycled) expanded polystyrene (EPS) as insulation, and has thermal mass in walls and floors - which double as heat storage devices. It utilizes reusable forms for shuttering to make the poured in-place walls (reduces cost of unit home - the cost of shuttering is spread over hundred's of homes), and utilizes recycled waste grass for thatch roof. It can be built using manual labor so offers employment opportunities as well as capacity building. It is for the most part dependent on Lesotho's internal resources and economy. The structure on the right, built for Sisters of Charity of Ottawa - Lesotho, is an example of a building type that combines low tech with high tech solutions - is not fossil fuel dependent for heating or cooling. The building is heated using a passive solar hot water system (SHW-P) - water is gravity fed and there are no heating elements or use of fossil fuels.The home utilizes a solar hot water (SHW) system for heating during winter, as well as solar photo-voltaic(PV) panel for electricity. Building's construction (first) cost is below the cost of construction of current building types in Lesotho. The life cycle cost, over a period of 30 years, is half the cost of current building types. It can be mass produced using precast panel wall system, or labor driven - as in our case, thereby providing employment for the large unemployed and unskilled population. The same process and methodology can be used to produce larger single and muti-story structures. The home has thermal mass for storage of heat in walls and floor during winter months, and an underfloor heat exchanger (hydronic) to store and release heat at required intervals during a 24 hour cycle. As far as this home is concerned, and we suspect for Lesotho for the foreseable future, the SHW-P is a lot less expensive and "Green" option for heating the building than other available options. Lesotho is a poor country in Southern Africa - located on a high plateau, and experiences extremes of temperature. 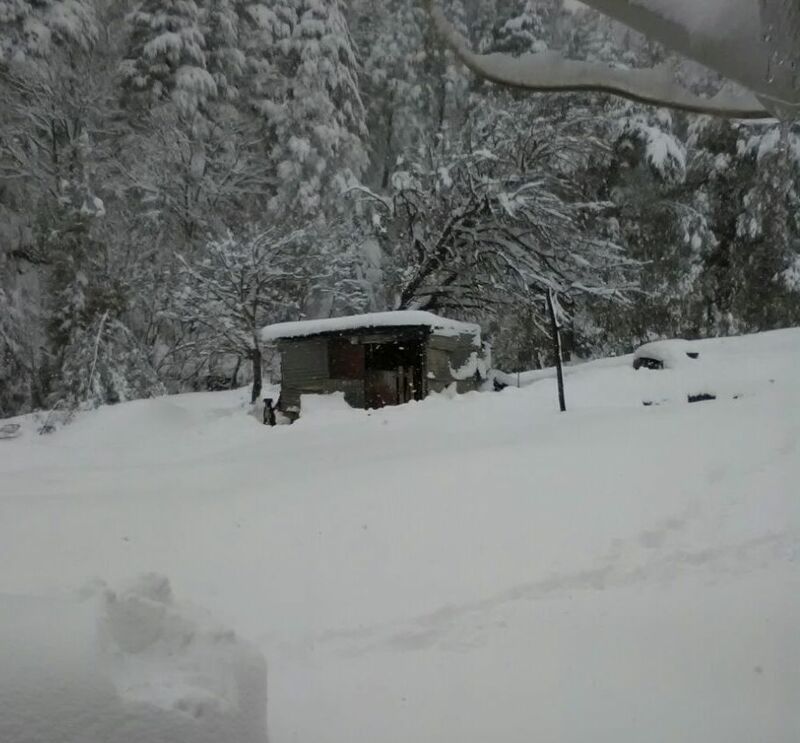 Winter temperatures in most parts of the country are below freezing, and summers are very hot. Homes are poorly built, are un-heated and un-insulated, and not suitable for the climate. Most people are unable to afford parrafin or electricity to heat their homes. The elderly and the infant are at the greatest risk for premature death during the bitter winter months. The few well to do who can afford to pay for heating their homes usually pay on the average 20% to 25% of their monthly salary during the winter months. Lesotho has limited options as far as building construction goes. It is mostly treeless - because of poor rainfall, geology, and deforestation in the past for firewood. Wood is imported, it is expensive, and is a fire hazard. Hence people in these parts generally resort to masonry or adobe construction. The former is a poor choice given that masonry structures are poorly insulated - or are very expensive to insulate, and the later is comparatively more difficult and expensive to maintain. 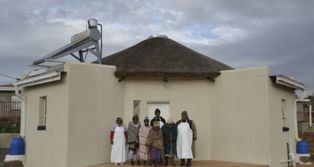 The prototype home in this picture, built for the elderly, is managed by Sisters of Charity of Ottawa - Lesotho. It was built by unskilled villagers and high school students, in 6 months or so. Similar buildings in future will take a lot less time - as the reusable forms for the structure are now fabricated and people have learned how to use them. The workers were trained by SARID's architects and engineers. It has passive heating and cooling features and it is warm in winter and cool in summer. It has thermal mass and it utilizes that property to store the sun's heat during winter. Insulated walls prevent the heat from escaping from the room. Most of the insulation is waste expanded polystyrene (EPS), recycled takeout boxes, that would have been burnt as trash. It also utilizes a solar geyser to heat the house, during severe sub-zero temperatures. The geysers also provides hot water for showers and laundry. The home houses four elderly people, and has an attached toilet and a kitchenette. Electricity is through Solar PV, thus making the building a zero energy structure for most of the year. Besides the economic ramifications of not importing fossil fuels or electricity for heating, which money can be directed towards economic development, these homes are "GREEN", sustainable, do not contribute to global warming, while encouraging self reliance and creating employment opportunities for the unemployed population. 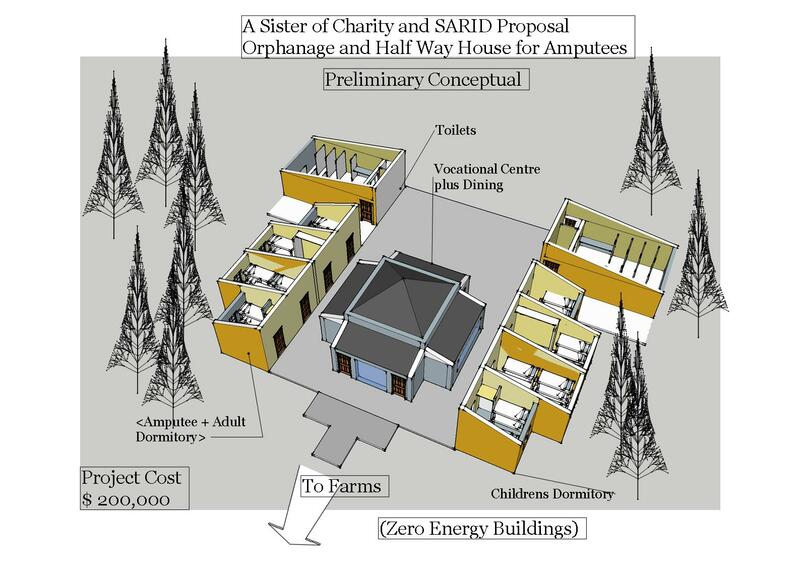 Given these issues in December 2014 SARID proposed to the Sisters of Charity Ottawa (SCO) to build a prototype structure which would be a non-wood, non-combustible (excepting for the roof), reinforced concrete structure, and which would be cheaper and comparatively more energy efficient. Walls above are only 30% concrete - the rest approximately 70% of the wall is made of waste and recycled material. The walls have an average insulation value of R-28 . Further the building type relies on locally available building materials and taps into the large unemployed and unskilled population as a labor resource. It is anticipated that these practices would in the long term create employment opportunities in the construction sector and supporting industries. Lesotho would engage, mobilize and leverage its internal economy as opposed to relying on foreign aid and imported technology and value added goods and services. The proposed building type for Lesotho represents a modest breakthrough not only for Lesotho but also for manysimilar poor and resource strapped countries in the world. The process may need to be tweaked to adapt to the country where structures are being built - but essentially it will lower the construction cost of buildings regardless of its geographical location. This has been the case in Haiti, Pakistan and Bangladesh and in New Orleans. The process can be adapted for seismic as well as high wind and tornado zones. In order to teach the people how to build the above structures the SARID/ SCO team started by converting a small storage space into a vocational center. A small investment was made on mostly hand tools. The first batch of volunteers ended up building the above prototype over a 6 month period. Most of these volunteers had only secondary school education, were previously unemployed, and had little or no prior experience in construction. After training the volunteers had learnt carpentry skills, use of hand tools, and other building /construction skills. Seeing the enthusiasm of the volunteers SCO decided not only to provide free training but as an incentive also provided food and a stipend. The hope is that the skills learnt will improve their chances of employment in the construction industry and perhaps make them capable of building a home for themselves. The proprietary technology, intellectual property of SARID, was offered at no charge to SCO. The structure is very well insulated, with an average heat resistance value of R-28 in the walls, and has utilized some 4,000 recycled waste polystyrene (Styrofoam) lunch boxes as insulation. Currently these EPS ( expanded polystyrene) lunch (takeout)boxes are burnt, considered trash, causing an irreversible ecological damage, ozone depletion and contribute adversely to global warming. The above picture is typical how the lunch boxes are burned and disposed off. 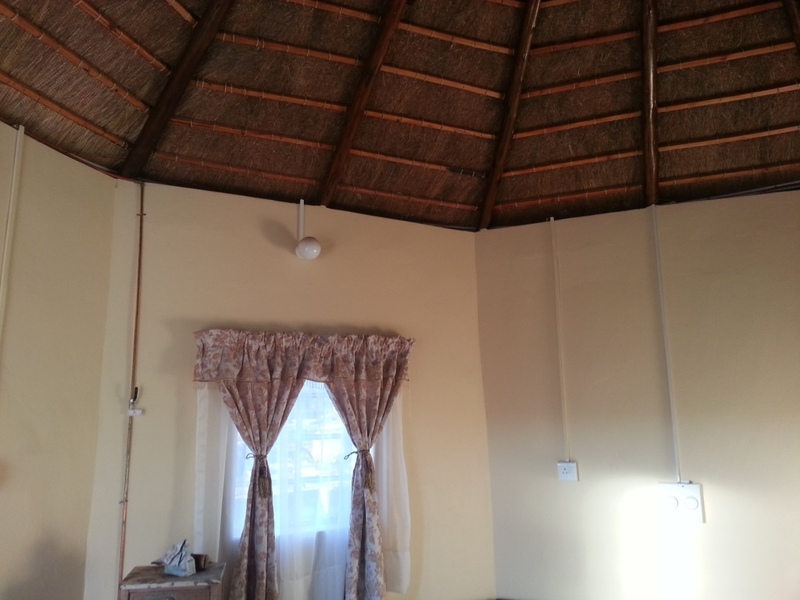 The building has thatch roof, sprayed with a fire retardant, and has an average heat resistance value of R-30. The thatch is also occasionally treated as waste material and burnt as well. In 2007 the mayor of Karachi asked SARID to build a prototype affordable two bedroom home, using their "MASS" technology in a slum area of Karachi, Pakistan. Karachi has extreme hot weather, with temperatures reaching 110 Fahrenheit in summer. SARID engineers design/ built an affordable soil cement home with insulated walls, made of waste styrofoam (EPS) boxes. The walls have an average "R" value (heat resistance value) of 20. In comparison a twelve inch thick masonry walls (uninsulated - the norm in Karachi) has an "R" value of less than 1.5 at best. The higher the "R" value the higher insulation value. Homes in USA have typically "R" value of 14. The home was designed with an internal courtyard to further leverage micro-climate advantages in a humid and and very hot part of the world. The mayor later innaugrated the home. 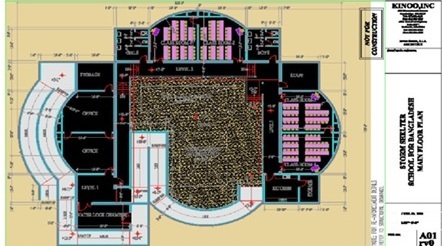 SARID's CASE STUDY: DISASTER AVOIDANCE AND MITIGATION - BARGUNA, BANGLADESH;- “MASS” TECHNOLOGY, Sustainable and “Green" Tsunami Resistant Shelter (TRS) proposed for a village in a high risk Tsunami prone coastal area of Bangladesh. The shelter was designed by SARID engineers in collaboration with engineering professors of Bangladesh University of Engineering and Technology (BUET) and USA based structural engineers. A local charity helped coordinate SARID's efforts with local officials and villagers. SARID's engineers visited the village site, after a major Tsunami event in November 2007 identified as the cyclone Sidr, had practically wiped out the village. 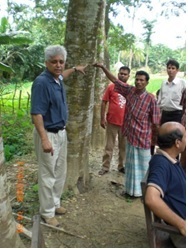 It was one of the worst natural disasters in Bangladesh's history. It killed thousands of people. An earlier Tsunami triggered by an earthquake in 2004, had killed over 250,000 in several countries - those living along the coast of Bay of Bengal and Indian Ocean. It was found that, at least in the case of cyclone Sidr people had adequate warning days before the cyclone touched ground, and the anticipated Tsunami some four to six hours before it hit the shoreline. They had heard learnt of the cyclone through multiple channels including television, radio, texting on mobile phones, and village elders. However, people had no where to escape to. Bangladesh's terrain is mostly flat, and the average difference in height between the low and high elevation from seashore to thirty miles inland is typically only about five feet. When a Tsunami hits the shoreline, in extreme cases in Bangladesh, waves can be anywhere from 18 feet to 24 feet high. The waves do recede in height as they move inland. Hence, there are no higher ground or hills to escape to. Also both humans and livestock need to be saved, as livestock are essential for the rural economy. If famers lose their animals, in more cases than not, farmers go bankrupt. More often than not they abandon their village to look for employment elsewhere - to start a new life. Villagers indicated that the only way to save themselves during the Tsunmai was to climb up a tree, which the elderly and the young could not do - hence the higher mortality among the elderly and the children. The villagers were also hobbled by the fact that in order to escape the Tsunami they needed to walk miles with their belongings, through paddy fields, to reach paved roads and transportation. People in Bangladesh do not have the money to build individual homes on stilts or highly resilient buildings that would be able to face the Tsunami. Hence SARID felt that the solution lay in saving the villagers as well as their animals. Hence, SARID proposed protective TRS - for groups of people and animals, located within the confines of the village itself. The TRS would also store emergency food, water, medicine and other supplies for at least a week until such time that help could reach them. The TRS would be served by mobile clinic, medical personnel and veterinarians, and perhaps would have a helipad for air ambulance. In future the TRS could be served by drones - as drones will soon become a reality, for food and medicine drop. During normal times the shelter would serve as a local school, a medical clinic, and if need be village administrative offices. Such satellite TRS could dot the coastline and would be a less expensive option than building sea walls or dikes. Local villagers were very keen on the project, and donated some three acres of their land for the project, but SARID was unable to raise some US $150,000 to build the prototype demonstration shelter. The project, we believe, would have also introduced a new affordable construction system that would have generated local employment and various cottage industries. Image below shows a 3D axonometric and plan layout as well as SARID engineers discussing the project with villagers. Thank you in advance for your generous support and tax-exempt donation. We need your help in order to continue with our work. Thank you ! Board of Directors, SARID Inc. This is how we spent the donation you gave us (see chart above). 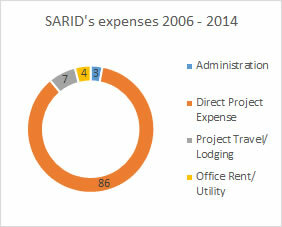 SARID’s officers and Directors have received zero compensation. They work pro bono, volunteer their time, and minimize all overhead expenses.Any and all technology developed by officers and directors are available to SARID free of charge. 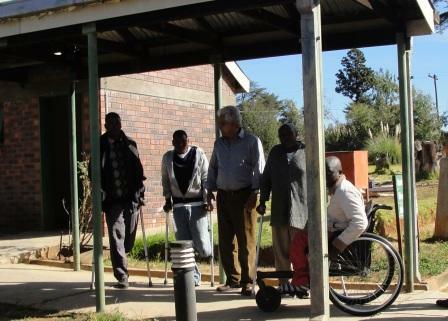 SARID is in discussion with various organizations to launch several projects in Lesotho. We are in the process of completing the design of these zero to low energy buildings. We will launch these projects once funds are in place. We have the land for the projects. 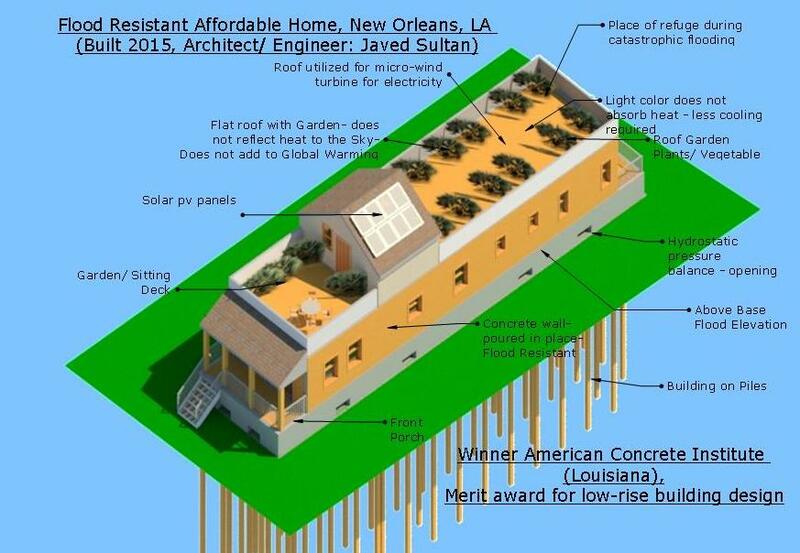 Home designed by Javed Sultan, Executive Director of SARID, wins American Concrete Institute's (Louisiana Chapter) 2017 merit award for design of low rise structures in flood zones. The home offers a new approach to designing sustainable homes in flood prone areas. Orphanage and Half-Way House for Amputees - project below # 030117. See preliminary concept (bird's eye view) below. 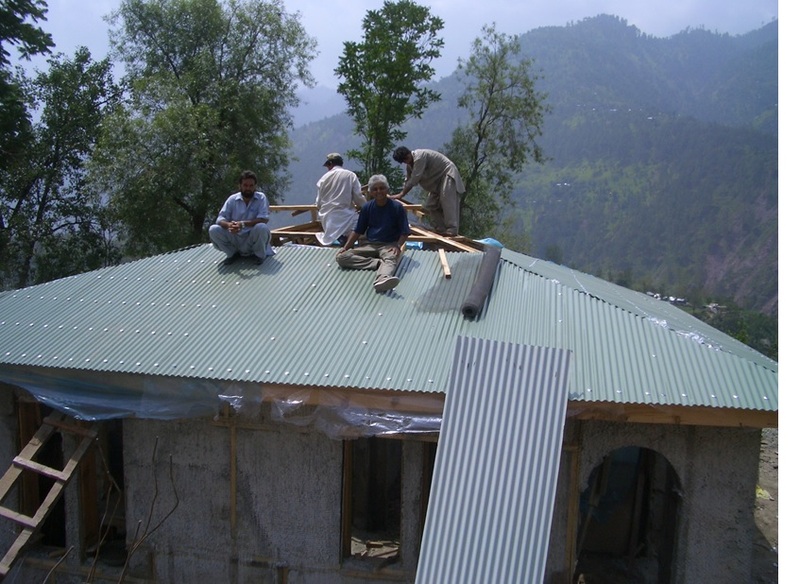 Also view earthquake resistant, non-wood, fire resistant, two and three bedroom affordable homes, built between 2006 and 2009 in AJK (Neelum Valley) Pakistan, for the Aga Khan Foundation. Click on Low Cost Housing link above. Tsunami Shelters in Bangladesh. Read on bottom left.